Notice the difference – rather than thinking the whole network is down, we know exactly where the problem is and can plan accordingly. The system becomes observable to the commuter. Reporting positives is something IT is generally pretty bad at. 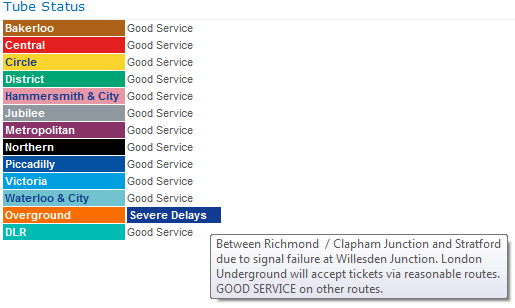 Instead it reports on outages, so people associate it with system failures, rather than consistent service. Reporting positive news is a great way to keep people feeling good about the work you do. Which brings me to wind power. One of the arguments the carbon addicted crowd use against renewables is that they can’t provide consistent power to national grids. They focus on failures. What happens when the wind isn’t blowing or the sun isn’t shining? But the truth is that renewables are increasing their consistency all the time – and we’re seeing a great deal of innovation in battery storage. 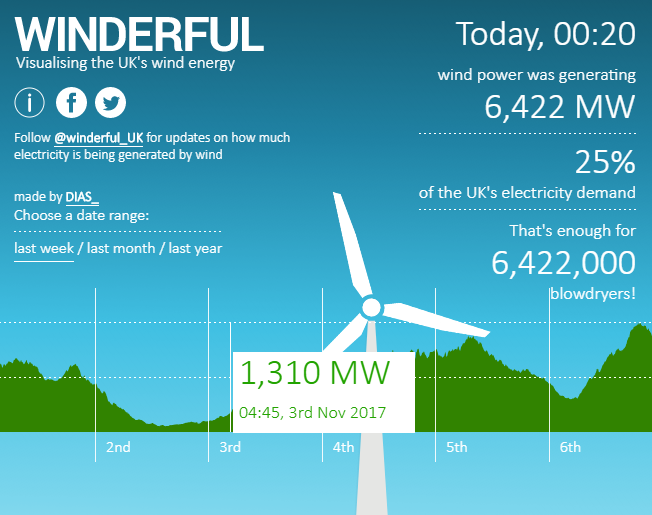 So this service Winderful (see the chart above), reports on how much of the UK’s electricity demand is currently covered by wind. You could argue that it’s after midnight, so covering nearly 25% of the UK’s energy needs isn’t such a big deal. How much power is 6.4m hairdryers? You might say – power needs are much smaller overnight, people are sleeping, and there are fewer industrial processes running, so these numbers are meaningless. But I would argue 6.4 million hairdryers is actually quite a big deal. That’s the equivalent of about a tenth of the UK population turning on their hairdryer at the same time. And it’s being covered – by wind turbines. The story-telling here is important. Imagine if the UK’s newspapers put the Winderful stats on their front pages every day, rather than the current rather sordid fare they carry. Running on renewable energy begins to look eminently possible, desirable and achievable. It’s time to stop saying we can’t make the change we need, and accept that it’s happening all around us. Every day, every week we’re hitting new milestones with renewable energy. And with better reporting we might help to change the dial on public perceptions at scale. Well done Winderful. Keep up the good work. I wrote here about renewables at scale, a story about Amazon’s latest wind power commitments. A couple of days later Microsoft made news with a major wind power deal in Holland. There is plenty to worry about, but there is also an incredible amount of good news out there. We need to report on the positive service stories, to improve overall public perception, and increase the political will needed for the Great Transition. Follow Winderful on twitter for more positive service reporting. Amazon and Microsoft are both clients. This is a brilliant initiative. just what we need. Although I do feel that regardless of the case wind power makes for itself, they’ll always be a certain reluctance to embrace alternative methods of energy production. It’s kind of ridiculous that there are so many rings to jump through for new wind farms, when it’s apparently very easy to start a fracking operation.